Last fall, I read The Man Who Changed the Way We Eat: Craig Claiborne and the American Food Renaissance after receiving a review copy and learned all about Craig Claiborne’s life. I didn’t realize that his approach to food writing was so revolutionary at the time. After studying at the Ecole Hoteliere de Lausanne in Switzerland, he sought out “the sublime” in cuisine, service, and dining experiences, and that’s what inspired his writing. He found disappointment in a lot of restaurants, but when his expectations were met, he was thrilled to share what he’d found. He had sophisticated taste that required teaching his readers about unfamiliar foods while not alienating them. After writing pieces for Gourmet, he became the food editor at The New York Times in 1957. His first NY Times Cookbook was published in 1961, and I have the revised edition from 1991 . I’d never sat down with this cookbook before since there isn’t a lot of introductory info or many recipe headnotes. But, after reading about Claiborne’s life, I was interested in finding out what recipes were in this book I’d had for several years. There are complicated and fancy things like Truffled Pate and Lobster L’Americaine, but there are also plenty of simple salads, pastas, vegetable dishes, and homey desserts. Most of the recipes have no notes or explanations about their origin, but the wild rice and mushroom soup did. It’s actually called Julie Wilson’s Wild Rice and Mushroom Soup, and Claiborne wrote that it’s “one of the greatest soups ever created.” He also pointed out that it’s a “bit time-consuming,” and he was right about that, but it was definitely worth the effort. I marked this page back in October and just got around to trying this lovely soup. There’s a version of this recipe online at the NY Times, and the quantities are slightly different from those in the book, but otherwise it’s the same. This soup can easily be vegetarian if vegetable stock is used, but the recipe was written with chicken stock. There are a few steps that require waiting or simmering, but those things can be happening at the same time. You start by rehydrating dried mushrooms with hot water. While those sit for at least 20 minutes, you can start cooking the wild rice which takes almost an hour. I found some nice, long grains of wild rice from Minnesota, and it was cooked in boiling water with a little butter. Next, onion, garlic, and leeks can be chopped while waiting on the mushrooms and rice. Once the dried mushrooms were hydrated, they were drained into a bowl so the soaking liquid could be saved. The mushrooms were rinsed under running water to remove any grit, and they were squeezed dry before being chopped. Tough stems were discarded. The soaking liquid was poured through a sieve lined with cheesecloth and reserved. Moving right along, olive oil was heated in a Dutch oven, and the onion, garlic, and leeks were sauteed until tender. The chopped, dried mushrooms were added followed by flour. This mixture was cooked for a few minutes before white wine, stock, salt and pepper, some Tabasco (I prefer Crystal), and the mushroom soaking liquid were added. This was brought to a boil and then left to simmer for an hour. Yes, this soup takes some time. At this point, it could be refrigerated until the next day. After simmering, the soup was pureed in batches in a blender. It went back into the Dutch oven and half-and-half was added. As it was re-warmed, fresh mushrooms were sliced and sauteed in butter. Once cooked, they were sprinkled with lemon juice and sherry. The cooked, fresh mushrooms were added to the pureed soup along with the cooked wild rice. Thyme and parsley were added, and the soup was ready to be served. Wild rice has always been one of my favorite grains, and I don’t cook it often enough. I love the chewy texture, and it’s a perfect match with mushrooms. This is a hearty and slightly decadent soup, but it’s a meal of a soup. There are layers of flavor from the dried mushrooms to the wine to the herbs added at the very end. I’m glad to have learned more about Craig Claiborne’s life, and I look forward to cooking more things he recommended. A beautifil soup! So exquisite, fragrant and refined. I love the wild rice to add to the overall flavour of this "wild" soup. Lovely looking soup! I'm a big fan of mushroom soups, although I get disappointed from time to time with bland versions. Here's hoping we get some more soup weather soon. I sure hope winter isn't over. You made this soup look so gorgeous...not an easy feat I'm sure! And the flavors sound amazing. Love how they are layered upon each other. 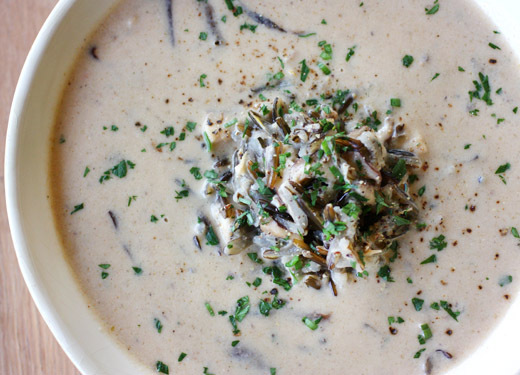 The Wild Rice and Mushroom Soup is a splendid rainy day recipe! Served with crusty bread and salad a sublime winter dinner beckons! Your soup looks so creamy delish! I love mushrooms any which way though I rarely make mushroom soup. Interesting about Claiborne... I know he's a god in the food world, but I never pull his NYT Cookbook from my shelf either. Maybe I should give it another try. Gorgeous soup. Looks flavorful and creamy. I would need some crusty bread with this. What a beautiful soup...and with so many good things for your body and soul. Thank you for sharing another delightful post. What a bright and happy way to end my Tuesday! I hope you are having a blessed week. This with your gingerbread would be a perfect meal! 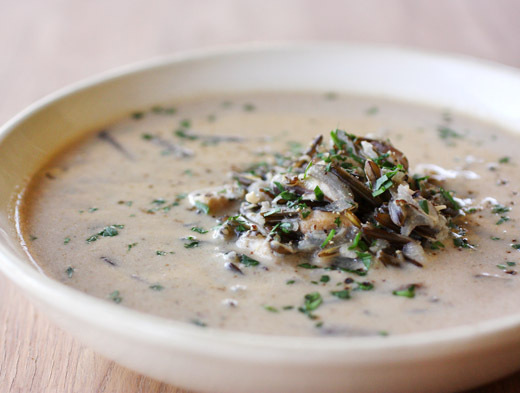 I love creamy mushroom soup and the surprising addition of wild rice which I think gives it an additional depth of flavour. This soup looks very tasty Lisa, creamy and flavorful. I like the wild rice in it, it sure adds a nice twist to the mushroom soup. The mushrooms and wild rice do seem to be a great paring. Both have that earthy appeal to them. I sometimes wonder about how long some recipes take to make and then we eat them so fast. I tell my family to slow down and enjoy a meal because it took me an hour to make. But no luck. A short time later it's all gone. What wonderful ingredients. A soothing winter soup. I have that book in my huge stack of things to read (and it's been there for months, so I should really get to it). Looks like a great soup. And the cold weather is back, so it's perfect! Thanks for this. This soup looks absolutely delicious and so perfect for the cold weather we have been having lately. I love mushrooms and wild rice together. Need to try some wild rice soon. I usually hold back on the wild rice as I am afraid it will take very long to cook. That variety of mushrooms you are using must be giving deep flavors to this soup. Oh, this soup is calling me! 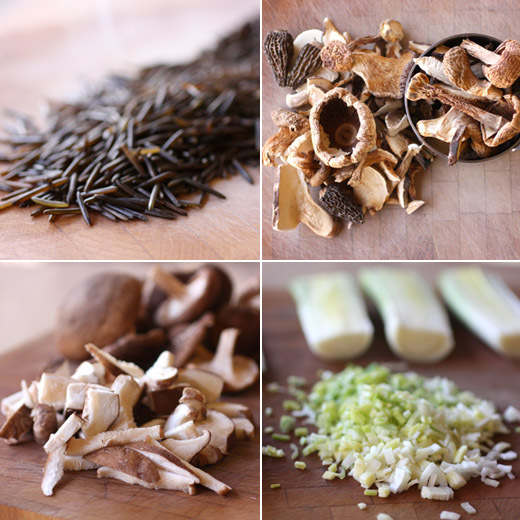 Seem to forget about wild rice, and pairing with mushrooms is perfect. I was really disappointed in the book. I found the first chapter fascinating and the rest tedious, just patched together repetitive bits and bobs that were, in my opinion, never pulled together to explain why it all made him so influential. I felt the auther just didn't succeed in talking about "the man who changed the way America eats" or how he achieved that. Buttttttt.... this soup looks absolutely amazing! I love a good mushroom soup and this one looks over the top perfect! Jamie, I agree the book became tedious in places with several similar events. But, I thought the info about the start of his food writing career was very interesting. He wrote about restaurants and dining experiences in a way that no one really had before. It was also interesting that he became so well-known and closely followed at a time when there wasn't much food writing and most food info appeared on "women's pages." I have a wild rice soup that's somewhat bland. I'm glad to have this recipe. Looks like it's loaded up with flavor. Thanks for posting it. I have his cookbook but hadn't noticed this recipe. Looking at you photo...it must be delicious..
funny I used to read a lot of Craig Claiborne's writing especially the books he wrote with Pierre Franey. I remember his face too. This soup sounds wonderful, should do it here with freekeh instead of wild rice, I am sure it would work real well .